Only a woman with a self-professed love all things geek, food, gaming, comics, and family could express her love for her brother so profoundly in a poignant blog post. Check out her blog Digital Noms . It combines her love of “geekery, cooking and things that seemed like a good idea at the time mashed together” with clever writing and a super woman voice. American food because he is all American (technically he is Kryptonian people), that he would eat whatever he wanted because he could, he would eat food from all over the world because he is everyman but he wouldn’t drink because that is bad. The list just keeps going. 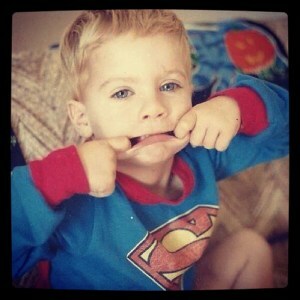 You see, JD became fascinated with Superman when he was about three. Soon enough he had the Superman (Christopher Reeve) movies memorized, was wearing his Superman pajamas whenever he could get away with it, and on occasion found the wrong moment to decided to put his underwear on the outside of his pants. This was always fun for making Mom laugh.When asked what he was going to be when he grew up he had one answer for years- Superman. (He had a brief break in this where he was going to be a Ghostbuster but he always went back to the red-caped hero.) JD also pretty much learned to read on Superman comics before starting school and they were a staple in the household for most of our growing up. I can honestly attribute my love for comic books to my little brother’s obsession. As I read Superman; The High Flying History of America’s Most Enduring Hero by Larry Tye (a fantastic book on the history of Superman that I seriously recommend), I found myself pondering the question all over again. Especially since I am writing a blog about all things geek…and food. Superman came from the minds of Jerry Siegel and Joe Shuster, two young boys with big imaginations looking for a hero. Without getting into any of the convoluted politics or history of Superman, let’s just say Superman struck a chord with millions. The need for someone who was there to look out for the little guy, who was going to take on injustice in a world that sometimes seemed so dark. Superman looked out for the entire world but still found time to fall in love. (Trust me I know his story isn’t all sunshine and butterflies, nothing ever is, but let me stick to this particular train of thought for now. I am talking about Superman himself as what he is intended to be not the publishing industry, or any of that for now.) People are passionate about Superman because he symbolizes what we want to see as the best in ourselves no matter where we come from. Recently, I realized I totally know what Superman eats, even what he drinks. Superman eats pizza, he makes a mean deep-fried turkey, he likes garlic fries if they are not too garlicky. He can eat hot wings that would give a normal person a nose bleed. He was a really picky eater as a kid but now will try anything. (We think it is because it was in a science class in school he ate the squid he had just dissected and then cooked on a bunsen burner and decided calamari was awesome.) Superman loves a good pitcher of beer when hanging with friends or at a sporting event. He drinks wine and knows his way around good vodka. This all sounds crazy until you realize that for me, Superman is inseparably linked to my little brother JD. To me, that is what Superman is. He is the everyman, the one who wants the greater good for those he cares about, even people he has never met. No matter your age, gender, race, Superman is a hero who doesn’t care about any of those boundaries, he is there. So the next time the conversation about what Superman might eat comes up, I know what my answer is. What is yours? Take a moment to think about the superman and superwoman in your life, they might not wear a red cape, or their underwear on the outside of their tights (until you give them enough tequila that is), but I am sure you know someone who is your superhero. What do they eat or drink? Maybe you should make them their favorite food, buy them a beer, or in the case of my little brother send a care package with his favorite treats and a couple Superman comic books. Miss you little brother, I am so proud of you. Come home soon. This entry was posted on October 27, 2012 by Robin Avni in cohort 12 reposts + links, food + beverage, gaming, technology, weekly themes and tagged comics, digital noms, gaming, girls, girls and technology, superman, technology, women.